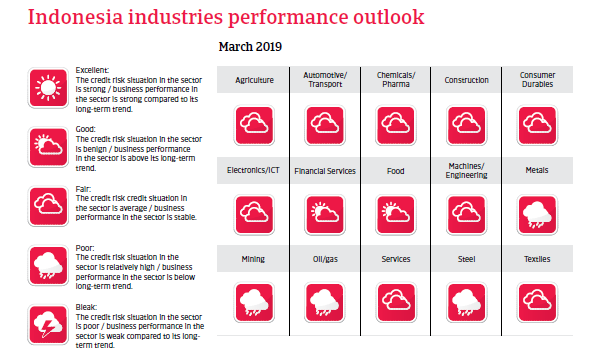 Indonesia´s short-term economic prospects are generally positive, but it remains vulnerable to sharply decreasing capital flows to emerging markets. Presidential elections are due to be held April 17th, 2019, and due to his widespread popularity it is expected that incumbent President Joko Widodo will win a second term. The outcome of the concurrent parliamentary elections may facilitate stronger collaboration between executive and legislative branches of government. The three main parties - DP, Golkar and PDI-P - endorse the Pancasila principle and thus the secular character of Indonesian politics. But the influence of fundamentalist Islam on the society has increased in the last couple of years, leading to intolerance of certain sects and the Christian minority. The Widodo administration has successfully improved economic stability by reducing regulatory burdens and passing reforms in order to increase productivity and inflow of foreign direct investment. However, despite those efforts economic productivity remains relatively low, hampered by poor infrastructure and the lack of a skilled labour force. Successes in combatting corruption and reducing bureaucracy remain limited, mainly due to obstacles at the local government level. 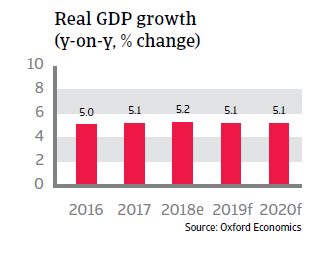 Indonesia´s short-term economic prospects are generally positive, with real GDP growth rates expected to remain at about 5% in 2019 and 2020, mainly driven by domestic demand. Election-related spending has supported private consumption in 2018 and in early 2019, while business investments continue to grow. Investment growth is mainly driven by infrastructure improvement (construction of new roads, ports and power stations). Government consumption growth is forecast to remain high in the coming two years. Export growth started to slow down in 2018, as demand from China (especially for commodities) has decreased. In general, lower growth rates in China and its shift towards a more consumption-oriented economy have a negative impact on Indonesian exports. However, exports account for just 22% of GDP, which makes Indonesia less susceptible to global trade downturns than some other Southeast Asian countries. In any case, the robust domestic sector would moderate the impact. The government deficit is forecast to average around 2% of GDP in the coming years, despite a rather low tax revenue base. The scrapping and/or lowering of subsidies on energy since 2015 has helped to keep the budget deficit under control. Public debt is expected to stay at a sustainable level of about 35% of GDP over the next five years. Indonesia’s external position has improved, as both foreign debt in relation to exports of goods and services and the relatively high debt service ratio continue to decrease, diminishing the country´s dependency on foreign capital. However, the annual current account balance is persistently negative, and the deficit increased to more than 2.5% of GDP in 2018, mainly due to a weaker rupiah exchange rate, higher oil prices and rising capital goods imports. Indonesia remains vulnerable to sharply decreasing capital flows to emerging markets, e.g. further monetary tightening in the US and/or decreasing risk appetite of global financial markets. This vulnerability is due to a high dependency on portfolio investments for financing the current account deficits, increased private sector external debt and the high share of Indonesian government debt held by foreign investors (about 40%). In the first nine months of 2018 increased risk aversion of financial markets led to capital outflows, and the rupee came under pressure. The government responded with import tariffs on a variety of consumer goods in order to lower the country's import bill. At the same time the Central Bank used foreign exchange reserves and repeatedly raised the benchmark rate in order to support the rupee exchange rate. Further exchange rate volatility cannot be ruled out in 2019, but a sharp currency depreciation is rather unlikely, as the external vulnerability is mitigated by robust economic performance, sound monetary policies, a resilient banking sector and because a large part of public external debt is long-term. However, Indonesian companies that have borrowed in foreign exchange without hedging the currency risk could face problems with their debt obligations if the rupee depreciates further. Indonesian pharmaceuticals sector growth is driven by a rising population and the roll-out of the government's universal healthcare insurance system.